We may not want to admit it, but most of us have at least one bad habit. Some of these bad habits are just annoying, while others can seriously affect our health. 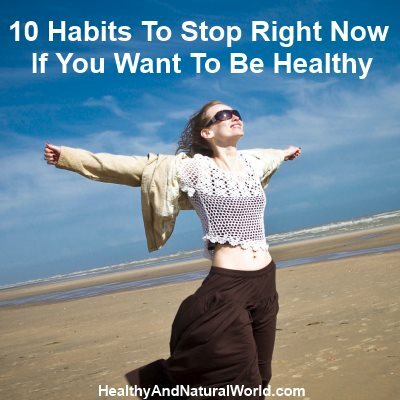 If you are committed to your health, then have a look at the following 10 bad habits to stop right now. You probably know why smoking is bad for you, but just in case you need an extra push to stop this bad habit then you should be aware that smoking is responsible for several diseases, such as cancer, chronic respiratory diseases, heart disease, as well as premature death. Smoking is also one of the most dangerous brain damaging habits and it’s also one of the causes of coughing up brown or black mucus. Tobacco smoke mainly consists of nicotine which is highly addictive, carbon monoxide which is a poisonous gas, and tar which consists of several cancer-causing chemicals. If you’re a smoker, you know how hard it is to quit smoking. But just to encourage you, 2 weeks to 3 months after quitting, your circulation improves and your lung function increases. one year after quitting – the excess risk of coronary heart disease is cut in half, and five years after quitting, the risk of cancer of the mouth, throat, esophagus, and bladder are cut in half, while cervical cancer risk falls to that of a non-smoker. Stroke risk can fall to that of a non-smoker after 2-5 years. Your family will also benefit from you stopping this bad habit because as second-hand smokers (or passive smokers) they are also exposed to the dangers of smoking. Further reading: Find here 5 scientifically proven ways to quit smoking. The cumulative effect of sleep deprivation can be devastating for our health, and I’ve written in the past about 23 Dangers of Sleep Deprivation – some of them will surprise you. When you have a good night’s sleep, you feel more energetic, happier, and better able to function. Yet so many of us don’t get enough sleep: some people are having problems falling sleep, or they wake up frequently during the night with trouble falling back into sleep and thus feel tired throughout the day. Most adults need eight hours of sleep a night to maintain a good health, but it’s not just the amount of sleep, it’s also its quality. If you have troubles falling asleep on a regular basis, you may want to have a look at these best 12 herbs for insomnia, these best foods to get better sleep, or this natural substance. Even napping during the day many benefits and can make up for sleep disorders. If you suffer from insomnia or have problems falling asleep, then short naps will help you to feel more alert and will enable you to function better. Part of living a healthy lifestyle is to pay attention to what you eat. While we all know that consuming more whole and natural foods is good for our health, it’s still impossible for many people to completely avoid processed foods, and for these people reading the label on food products is very important. Are you one of the people who read the labeling on the food products when you do your shopping? Do you check the ingredients of what goes into your body? Many people don’t do so, and it’s a pity as they don’t realize that some of the common ingredients found in processed foods can be harmful for their health, and you can find them in my previous article about the top 10 worst ingredients in food and you will also find more information in my other article about the top 10 worst fake foods to avoid. You may not see right now the harmful effects of these substances, but it’s the long term and the cumulative effect that counts. The previous habit was about WHAT you eat, however this habit is about WHY you eat. Are you one of those people who need chocolate or ice cream to feel joy or comfort? If it happens too often and you find yourself raiding the fridge for comfort, then you are “emotionally eating”. The link between diet and mood is well known, but do we really turn to foods that make us feel better for the right reasons? Usually we tend to think that a bad mood, stress and anxiety cause us to eat more and we find a cure in eating. This is true. In fact, if we are honest with ourselves we will find out that too many times we approach the refrigerator looking for something to eat, not because our stomach led us to it, but because we felt internal “tingling” for something to fill us up. You may be dealing with stress at work, or have concerns for the kids or even an unexplained sense of sadness or irritability. This is the reason why so many diets fail – they concentrate on the menu – which is critical but insufficient but they miss the most influential organ affecting our weight – the brain. I’ve already written an article on how emotional eating affects your diet, and you can find there tips that may help you controlling your emotional eating. If you are suffering from stress, you can read my other posts about natural remedies that will help you to reduce stress and about 7 simple meditation techniques that will help you to reduce stress. Many people spend most of their time sitting at the office or in front of the computer for eight hours a day, but when they come home they exchange one seat with another – sitting on the sofa watching TV or continuing to surf the web at home. However our body is designed to move. Our bodies and our muscles work best when they are worked, and then allowed to rest. In addition to the obvious muscular and cardiovascular benefits of moving, it also improves our body’s blood circulation thus ensuring the transportation of oxygen and nutrients to every cell in your body, and the removal of metabolic waste from our body. I know it’s often hard to find the time to exercise, but 30 minutes a day, five times per week can make a huge difference. Moderate intensity walking is something that can easily be done. Get into the habit of finding activities you enjoy doing, as any type of physical activity that gets your blood pumping is good. You can walk, bike, run, swim or anything else that you like. Modern life has become stressful for many people: meeting deadlines, having a high pressured job, or just constantly having feelings of fear and concern. Actually, stressful life became for many people a way of life. Anxiety is considered to be a normal reaction to a stressor, and in small dosage it may help us to deal with difficult situations and motivates us to perform at our best. However, when anxiety becomes overwhelming, it affects our daily life and may even become a disorder. Stress has many negative health effects and you don’t need a doctor to know that stress plays a major role in the health of our gut. The biochemical changes that occur when we are stressed have significant and immediate impact on our gut function. When feel stress, our brain releases various hormones that cause changes to the digestive system in the short term, such as lack of appetite, heartburn, nausea, diarrhea and stomach pain. In the long term, prolonged stress can worsen chronic diseases such as irritable bowel syndrome (IBS) and heartburn. It not only affects existing chronic diseases, but may also lead to the development of a variety of gastrointestinal diseases such as gastroesophageal reflux disease (GERD), peptic ulcer disease, inflammatory bowel disease (IBD), and even food allergies. Stress can cause inflammation of the gastrointestinal system, and makes you more susceptible to infection. Learn how to reduce stress levels in your life. To help you better cope with stress, read my article about 14 Effective Natural Remedies for Stress and Anxiety and 7 Simple and Effective Meditation Techniques to Reduce Stress. You don’t have time to exercise. You don’t like exercising. You don’t have time to cook at home so you opt for processed foods. You are too fat to start a diet. You haven’t been successful in the past quitting smoking. You are too old to change your habits. Are these excuses sound familiar? Do you find yourself finding all sorts of excuses or self-defeating thought that keep you away from reaching your goals? Well, this is the easiest way for many people. There will always be excuses for not doing something. Instead of this approach, try to look at “full half glass” – finding physical activity that you enjoy, being aware of the benefits of living a healthier life and how great you will feel and look, giving yourself a second chance if you have failed in the past, finding your inner strength and commitment to make better choices in your life. I promise you that once you start to see the good results, they will be a good incentive for you to keep up the good work. Some people have been used to living an unhealthy lifestyle all their life. Other people may suffer from many ailments and may be overweight. Then one day, or as part of a New Year resolution, they declare loudly to everyone that from now on they start to adopt a healthy lifestyle eating only fruits and vegetables and stop eating processed foods completely, or start exercising every day. Declaring big goals and changes you cannot follow can backfire on you and make more harm than good and make you return to your old habits. These big commitments are too daunting and hence can be short lived for many people. Don’t be caught in a trap you’ve created for yourself. Every great journey starts from one small step. Instead of committing yourself to big goals that can be hard for you to implement and will only cause you frustration, try to break the big goal into smaller and more manageable and realistic steps that you are better able to achieve. It takes time to get used to new habits, and often the change needs to be gradual. If you cannot exercise every day for 30 minutes, start with a shorter routine 3 times a week. Being consistent for the long term is more important than big changes that are short lived. Living a healthy lifestyle is not just about exercising, eating healthy foods and avoiding self-defeating thoughts. It’s also important which people you surround yourself with. It is especially important when you want to do positive changes in your life. If you are involved in relationships that have bad impact on you and drain your energy and emotions, then your happiness and well-being are compromised. Instead, surround yourself with people who have a positive impact on you, make you feel good and help you feel energized. At the same time let go of people who have a negative impact on you. Don’t let negative people drag you down. Instead, maintain a good social relationships with people who genuinely care about you. Listen to your body and to what it tells you. It’s important to understand that it’s much easier to prevent disease than treating it. The required energy for preventing disease is minor in comparison to the energy required to overcome it. There are stories about people who suspected that something was wrong with their health, but were too afraid to go to the doctor, fearing the worst. Although their problem was not so big, the worst did come eventually because they didn’t take care of their health. While you may still be worried, and this feeling is well understood, you need to do your periodical screenings or checks, learn about the disease if you’ve already got it, and commit to your recovery with a clear diagnosis and treatment plan. Look at your fingernails as there are specific 11 health warning that your fingernails may be sending. i had a chest pain and breathing problem too.i went to hospital for check up and i didn even x ray but doctor said its fine but this same problem never stop. nowadays i got more tense that i lose my weight( 54 to 49 ), i am having chest pain, coughing and shortening of breath which led to cough. i am not getting any treatment from hospital so if i do treat my myself at home with home remedies. i will be very grateful if i could get ways/step that i can follow you.as to my health problem. Hi Sangay, there are several causes to shortness of breath such as a problem with your lungs or airways, or a heart problem, or panic attack and anxiety and probably more unusual causes. I cannot give an advice as there is first a need to establish the reason for it, and this is something that needs to be examined by a health professional practitioner. I believe it’s best to talk about it with your doctor, who is able to devote to you more time than in hospital. If you are not happy with what one doctor says, get a second opinion and find a doctor that will listen to you and take your complains seriously. There is a need to dig further deeper to find the source of the problem, and I’m unable to do so. Hi Sangay, what kind of chest pain: upon inhaling or exhaling? mild or deep in the chest? Is the pain constant with breathing in general? Or with specific body position does the pain intensify? Is the shortness of breath only with exertion (like going up steps or lifting? )Do you have shortness of breath when sitting/standing still? Is there mucus congestion in your head/nose/chest that accompanies the shortness of breath? You are concerned about your weight – how much weight do you NEED to lose to be more healthy? HOW MUCH WATER DO YOU DRINK DAILY? FIRST: start drinking a glass of water withing 20min of waking up; then another glass within 1 hour of the first glass. Are you ambulatory/mobile? I’m very interested in helping you to understand your body and its needs; and what you can begin to do to resolve such serious issues until you can find a doctor – you should seek an Internist and/or Chinese medical doctor. Look forward to hearing from you.